Halifax coach Richard Marshall gave his side a relatively modest “eight out of 10” after watching them open up a three-point gap over Dewsbury in the Championship with a 46-16 demolition at the Tetley’s Stadium. 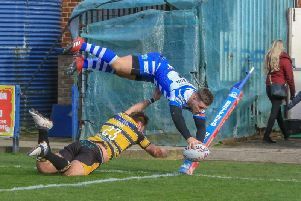 Captain Scott Murrell, back rower Dane Manning and Australian prop Mitch Cahalane all scored twice as Fax smoked the Rams, leaving them sitting fourth on the league ladder, ahead of Featherstone and next weekend’s opponents, London, on points difference. “I’d probably mark it about an eight out of 10,” said Marshall, whose side are now on a four-game winning streak, all away from home, ahead of next Saturday’s showdown with the Broncos at Cougar Park (6.0). “It was quite subdued in the dressing room after the game, which means two things. “One, they’ve given everything for each other and two, they know that it’s still a job that’s only half done at the moment in terms of that fourth place. “It wasn’t our best of the season; they got a couple of offloads on us in the first half and we needed to improve our contact. “We went 18-0 up and fell away a little bit, but for a lot of the second half we were pretty dominant. “We fixed a couple of things up around the ruck and although we gifted them a score we worked really well as a team and it was an important win for us. “London is important, but it’s the same the week after and the week after; I think that’s how it’s going to be now between now and the end of the season. “I’m pleased we’ve been on the road for four weeks now and we’ve got four wins. “If you’d offered me that at the start of the season I’d have taken that; we’ve done really well. “I think going back home to the Shay at some stage, with the confidence we’ve gained, will stand us in good stead. Murrell, who had been in doubt with ankle injury, was at the heart of Fax’s performance with a string of inspirational contributions in attack and defence. “Scott’s played really well, even though he’s not 100 per cent fit,” said Marshall. “His 40/20 in the first half was a big play at the right moment and it had a big impact on field position. “He was running and taking the line on and it was nice for him to score. “I got him off the field with 10 minutes to go, which I’ve been trying to do for the last two weeks but we haven’t been in a position to do it. “To be fair, we had a lot of very good individual performances and I thought the players on the edges all played really well.